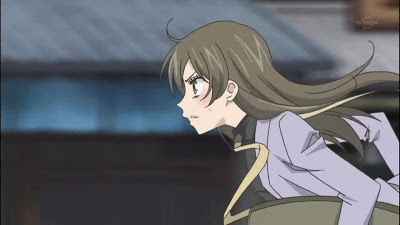 If you ask me to tell you one major reason Kamisama has kept me following this series for the entire season, it'd be the ending theme song. "a-a~a-a, a-a~a-a, kamisama..." It was such a catchy song that it alone was almost enough for me to watch it every week. Having said that, however, it's not this series' only redeeming value. Overall, it's a rather light story, as there isn't really much of a complicated plot going on, but there is no lack of dramas. By swapping rapidly between seriously touching moments and outright silly comical acts, it created a peculiarly interesting contrast where the those moments meant to be were much more moving, at the same time, softened up some intense rigid moments. The end result, is that the funny part of the series is much more funnier, and the dramatic moment is much more moving. The plot of the story follows the typical snowball anime where each event gets resolved in the story lands more characters in the core group and eventually they all meet up in the end to do a huge favor for the heroine. Recommendation: In my opinion, even though I wouldn't consider this a top notch anime, it's well worth my time and it's very entertaining. While it's not enough to make the must-watch list, I'd definitely put this one high on the second-tier list.